I hate wasting food. I just cleaned out my refrigerator last weekend and made sure that every bit of holiday food was used up or tossed. It can be a fun challenge to use everything up in creative new ways. Here are some of ideas I've heard about over the years. 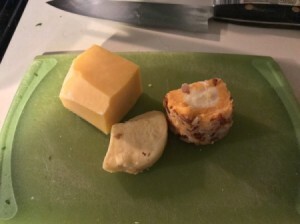 Leftover party cheese is wonderful to substitute for cheese in any type of sauce, dish or casserole. Pictured are my own cheese drawer finds. Most cheeses blend together wonderfully so throw them all together. Charcuterie meats, such as salami, pancetta or prosciutto, could be incorporated into the cheese recipes above. Or they could be used for some decadent sandwiches or as toppings on a gourmet pizza. A friend of mine had a New Year's party for both kids and adults. As a result, there was a ton of leftover snacks, all sorts of cheeses and creamy dips. She mixed them all together to make macaroni and cheese. The whole family said it was delicious. I usually make quiche with any uneaten cheese bits but I might make mac and cheese next time. I often make smoothies for breakfast a few days after a gathering or holiday, to use up any extra fruit. I also have made a fruit salad, dressed with lime and honey. I might also make a tart or a cobbler, depending on what I'm left with. And if that is too much, I'll freeze it to use later. Now that I have a food dehydrator, I'm going to try drying fruit to add to trail mix in the summer. That would be a perfect use for a leftover fruit tray. The veggie platter is the one that I most often see people tossing. But there is often no good reason not to save these. They are already prepped for cooking. As I'm nearly always making soup, the carrots and celery can go straight into the pot with the simmering bones. Cauliflower and broccoli can be frozen to add to my next stir-fry. If I have leftover cucumbers, I will add some vinegar and spices and make refrigerator pickles. If you have leftover olives or other pickled vegetables, you could chop them very fine and make a tapenade or relish. You could even add this to the cucumber pickles we were making above. I'm definitely going to try this next time. I love to use rolls from dinner to make little sandwiches later than night or for lunch the next morning. If I have too much bread to eat through, I will cut it up into cubes and let it dry. I can then make croutons to add to soups or stews (or snack on! ), or I can make them into breadcrumbs. Sweet pastries can be frozen and then defrosted for a quick breakfast treat. They can also be cubed and made into a delicious bread pudding. Roast or grilled meats are a staple for many of our celebrations, whether it be Thanksgiving or Independence Day. These are never leftovers to ignore. Often, they can be utilized for dinner for several days, with planning. Slice your roast meats thinly for sandwiches. Grilled meats, like chicken breasts or beef skewers can be added to wraps or salads, or used in other dishes. If you have a great deal leftover, chop it and freeze it in portion sizes for soups or other meals. If you are roasting something with bones, like poultry or in-bone ham, be sure to make a broth from it. You can use the roasting pan directly, or use a pressure cooker or slow cooker. Once I went to a friend's house for Thanksgiving dessert. She was getting ready to toss her entire turkey frame right in the garbage. I had her put it in a plastic bag for me instead and added it to my own pan at home. She laughed at me but the soup turned out wonderful. You can use up many classic side vegetables as part of a soup. Flavor it depending on what you have. Take the broth you made above and add in some onion, some diced carrots and celery from the veggie tray and the cooked veggies from the side dish. You can add noodles or rice and some frozen or canned vegetables if you need. If I have very brothy or overcooked veggies, I might blend them up to add them to a soup or casserole. You can also freeze the vegetables in either individual or family-sized portions, to be heated up later. I do this with stuffing and potatoes at Thanksgiving. Most of all, be creative. Look at the ingredients and see if you can see how they all go together. I treat it as a challenge. Last weekend, I made lasagne, taco soup and quiche, mostly from the odds and ends from the holidays. It saved me a weekly shopping trip, at least and filled up my freezer with ready to go meals. I'd love to hear about how you avoid waste by using up foods like these. Please share them in the feedback.